Use The Self Help Software Awakening Kit To Accelerate Your Awakening! Inspired Awakening Kit Self Help Software Re-Minds You To Re-Member And To Act Upon What You Already Know! ...As I assume you are, then you know that one of the most difficult challenges is to continually remember that the way life actually is and the way you've been taught life is are mutually exclusive. That is to say, most people were taught and now they believe that life is hard and that a certain level of pain and suffering must be endured throughout their life. By continuing to remember and to practice your understanding about the way life actually is and by allowing life itself to bring evidence of that to you through your experience, then very soon your life will be one of ease that's full of abundance, peace, joy and happiness, without any pain and suffering attached - although, YOU are the key to actualizing this reality! To assist us with the process of remembering I created the Awakening Kit self help software package. All of the above are due to the beliefs you hold and your way of thinking. Look friends, it’s all very well learning about the true nature of existence, it’s great to know why you are always sick or in a bad mood, why you never have any money or why your relationships always fail. However, if you only understand these things on an intellectual level, without acting upon them - more often than not - then very little can change for you. The key to making positive change in your life is to live by what you now believe to be true through your day to day behavior. After all, the action that you actually take most often speaks far louder than any intellectual understanding you may hold. The Awakening Kit self help software is designed to help you to remember and to act upon the things you believe on an intellectual level. Below I offer 3 possible scenarios in which the Awakening Kit will remind you of truth. Challenge #1 Health - You often suffer from "catching" a common cold. You say you understand that all reality is contained within you, and yet you continue to believe and to state that: "there's a cold 'out there' that's going around and I'm sure to catch it!" Solution #1 Health - The Awakening Kit reminds you to change your story. Do not project the idea of a future reality in which you have a cold. And only tell people you had a cold, never continue "your story" that you currently have a cold, thereby reinforcing your belief and prolonging your dis-ease. Challenge #2 Money - You continually suffer from an abundance of lack. You say you understand that there is no reality other than any reality you most believe to be true, and yet you continue to focus upon a reality in which you do not have financial abundance! Solution #2 Money - The Awakening Kit reminds you to only focus upon any reality that you prefer and ignore all other reality choices. Stop projecting negative ideas of reality into your future. Only choose the kind of reality that you say you prefer in each and every moment. Challenge #3 Relationship - You are currently alone and you desire, but lack a romantic partner. You say you understand that all beings in your reality are "your versions" of those beings, and yet you fail to realize that "they" only have the ability to reflect your state of being back to you. Hence, when you offer a lack perspective, the "others" have no choice other than to offer a reflection of lack! Solution #3 Relationship - The Awakening Kit reminds you to first love yourself unconditionally and absolutely. Then and only then will you begin to see reflections from the "apparent others" of the love you desire, the love that you are. Only then can a truly romantic "soul connection" relationship follow. By using the Awakening Kit self help software package you will be reminded how to: avoid negativity, learn from your fear, choose not to be angry and minimize worry and disappointment. Through the process of imagining what you do want you will also begin to enjoy excellent health, financial abundance, lasting relationships and spiritual understanding - all with minimal effort! The Awakening Kit passively assists with your spiritual awakening. By using the Awakening Kit self help software package you’ll learn to remain focused in the present moment and thus you’ll maintain your state of peace and harmonious well-being. And if you do go off track, the awakening messages will appear at exactly the right time to remind and assist you to bring yourself back into harmony and balance! Each product contained within the Awakening Kit self help software package is a stand-alone product. Each of these products on its own is worth the price of the complete Awakening Kit package! After downloading, the Awakening Screensaver is installed on your computer. The screensaver is pre-configured to use the shuffle display setting and has an image display delay time of 7 seconds. You choose when it will start displaying the images on your computer monitor, i.e. 3 minutes, 5 minutes or 10 minutes etcetera. Because, there’s no such thing as randomness, chance or luck each time you happen to see one of the images the message it contains is a coincidence (two events occurring simultaneously) caused by vibrational attraction. Thus the message you see will be the one that you most need to consider at that time. Please note: the images are not designed to just browse through them! The Awakening Words eAlbum is a beautifully laid out professionally made eBook for use with PC or Mac. The Awakening Words eAlbum double page has 59 double pages containing each of the 50 images from the Awakening Screensaver, plus an additional 5 images used to clarify and introduce each of the eAlbum's subject sections. 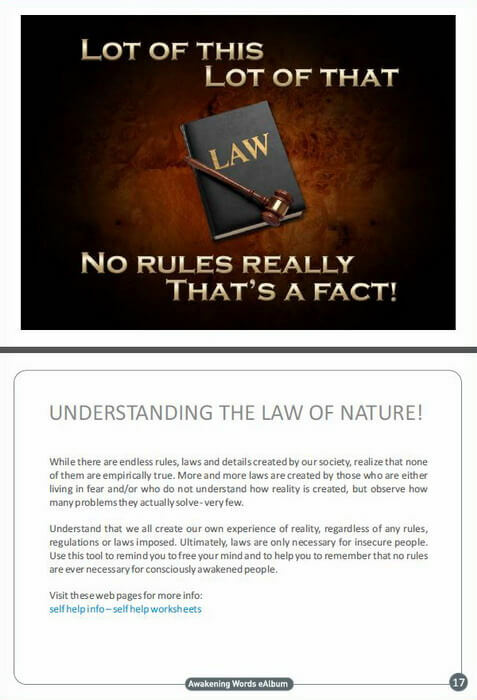 On the left hand side of each image page, there's the expanded explanation page that I’ve written which goes deeper into the meaning and usefulness of each of the images and inspired messages, as in the example below. Page 9 of the double page eAlbum. The Awakening Words eAlbum single page is a beautifully laid out professionally made eBook for use with Smart Phones in landscape mode. The Awakening Words eAlbum single page has 117 single pages containing each of the 50 images from the Awakening Screensaver, plus an additional 5 images used to clarify and introduce each of the eAlbum's subject sections. Each image page is displayed first, followed by the expanded explanation page that I’ve written which goes deeper into the meaning and usefulness of each of the images and inspired messages, as in the example below. Pages 16 & 17 of the single page eAlbum. The Awakening eAlbum can either be used as an eBook that you read from cover to cover or as an accompaniment to the Awakening Screensaver or the Awakening Images. If you are unclear about any of the inspired images, simply browse to the image in the eAlbum and read the expanded explanation. 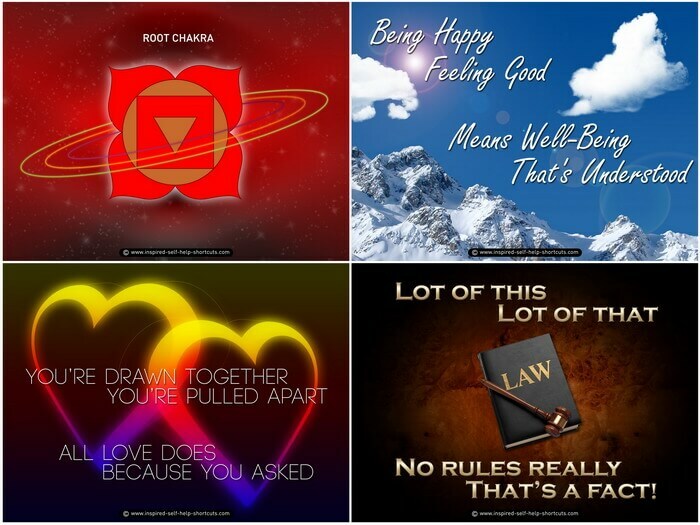 The Awakening Images contain timeless messages that focus on the five main areas of: enhancing spiritual awareness, achieving and maintaining the state of well-being, attracting and manifesting abundance, relationships (soul connections), and understanding and balancing the chakra energy centers of your body. Because of the timeless nature of the Awakening Images, I've included each of the 50 images/messages as an individual (1280 x 924 pixels) high quality JPG file and have included them as part of the Awakening Kit self help software package for you to use freely. After you've purchased the Awakening Kit, I grant you full permission to use any of the images/messages (unaltered) in ways that you feel will assist you to achieve a greater sense of awareness and understanding. Here are some suggestions for using the images: I highly recommend that you save these images in a folder on your smart phone and set them up to be used either as a screensaver or a slideshow or both. The smart phone slideshow app I use is Fotoo. Fotoo can also be set as a screensaver that's activated when your phone is charging. Tip: with Fotoo you can activate the slideshow at any time, not only when your phone is charging! Also it might be a good idea to set these images to display as your computer or smart phone desktop background. Set it up so that the images randomly change at a particular time interval. There are many computer applications and smart phone apps that give you the option of doing this. The point is that you want to see these images somewhere randomly throughout the day. They are not designed to just browse through them, although you can do that in the Awakening Words eAlbum. If you discover other ways to use these images please let me know in the reviews section, thanks. I'm very happy and I'm feeling good. I love myself and my life unconditionally and absolutely! Then in that moment, you’ll know that you’ve awakened from your total slumber, a slumber in which, at some level of your being, for your own reasons and for your own growth, you purposely chose to impose limitations on your conscious awareness and your personal power - as did we all. I don't believe in hard work - I never have and I never will! Who Will Benefit By Purchasing The Awakening Kit? Anyone who is having difficulty in any of the areas mentioned previously will surely benefit! Anyone currently at the Entry Level section of this website will be inspired to remember! Anyone who understands the Deeper Level subjects of this website will benefit from pertinent reminders! Anyone who already understands much of the nature of existence and who loves shortened explanations! Important: unless you have already started your spiritual journey and begun to awaken, the Awakening Kit Self Help Software Package might not make sense to you! However, if what I say on this website resonates with you then you will find benefit from the Awakening Kit, it can be no other way! BONUS: there are two versions of the screensaver - below 20" monitor size and 20" and above monitor size. Both versions are included in the Awakening Kit package! Once purchased you will receive an email containing the link where you can download the compressed (zipped) file. I personally guarantee that if you’ve browsed some or all of the pages on this website and you find that a lot of what I’m saying resonates with you and makes sense, then you’ll love the Awakening Kit self help software package and it will benefit you by assisting you to BE more of yourself. You could use the Awakening Kit for a month, forget about it for 10 years and upon using it again it will still be as relevant as it is today! I further guarantee that the frequent reminders of timeless Universal truths contained within the Awakening Kit will be highly beneficial in assisting you to remember more of the truths of life and the true nature of existence. Get the Awakening Kit to experience the states of freedom, abundance, bliss and well-being! Why not choose to awaken sooner rather than later? Get The Awakening Kit Now! Special Introductory Offer 50% Off Regular Price! The above links take you to PayPal. The name on my PayPal account is Kanlayanee Seamkung. Once payment is received I will use the email address listed in your PayPal payment info to send you the download link. To keep the price as low as possible I'm using a manual system, so please allow up to 12 hours for receiving the email containing the download link. Please Note: if you don't want to use the PayPal email address or if it's incorrect, contact me and let me know. I don't need your email address for any other reason and I won't use it to contact you for anything else! The Awakening Screensaver is a software application that you’ll install on your computer. This screensaver was designed to run on desktop, notebook and netbook computers and has been extensively tested using both Mac and Windows computer operating systems. The Awakening Words eAlbum PDF was created with and fully tested on Abobe Acrobat Pro. Please install Adobe Acrobat Reader (version 5.0 or later) or another PDF reader program on your computer or app on your smart phone. There are no special requirements for the Awakening Images. The downloaded compressed (zipped) file can be opened by your computer’s default compression (zip) application. Important: please disable your antivirus program before installing the screensaver! And please visit the Awakening Kit selfhelp software page for any software support questions you may have, thank you. Anyone on the path of self-discovery will be challenged by the deeply embedded false truths that have been handed down for many generations. Thus, when you state your truth or discuss the true nature of existence with those around you, you may be met with laughter, ridicule or outright sarcasm. Still, those who don't know are not wrong, they have simply believed in the age-old false truths of this paradigm. That's why I firmly believe that it makes sense to get reminders from those who know, rather than from the majority who don't know. Update: I’ve been using the Awakening Screensaver on and off for more than one year now. And it never fails to amaze me when I return to my computer and see a timely and valid message displayed on my monitor. Quite often I’ll be thinking about something and perhaps there’s an element of worry, doubt or fear going on in my mind. And then I see a truly self-empowering message that serves to remind me that my fears only exist within my mind and that I can choose to think better thoughts at any time. If anything goes wrong when ordering or if you're unclear about anything, just contact me and I will help you. PS. Read the Awakening Kit self help software package story on this Awakening Self Help Kit page. PPS. Please feel free to ask questions and/or write a small review here. Have a Question About or a Review for This Page? Please submit questions or reviews about the Awakening Kit Self Help Software. Please Enter The Title Of Your Question or Review Here! Your question/review will appear on a Web page exactly the way you enter it here. You can wrap a word in square brackets to make it appear bold. For example [my question] would show as my question on the Web page containing your question. Click here to see the rest of the form and complete entering text for your submission. 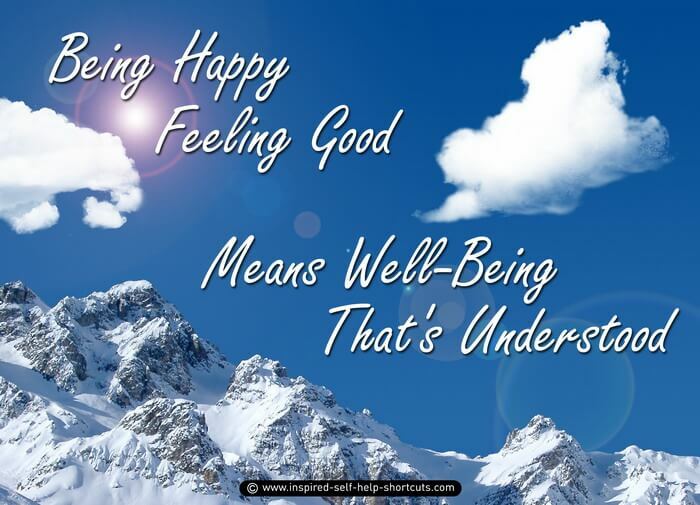 The Awakening Kit Self Help Software Has Beautiful Graphics and Simple, Effective Messages!